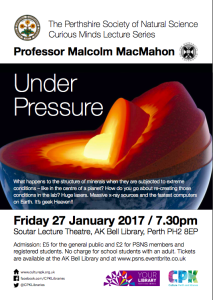 The next Curious Minds talk, on Friday 27th January, is by Professor Malcolm MacMahon from Edinburgh University. Malcolm is an expert on the properties of materials at enormously high pressures, conditions that exist at the centre of planets. The Edinburgh team have developed methods to re-create there extreme conditions in the laboratory using some of the World’s most powerful lasers and x-ray sources.